You know that aisle in the grocery store where they put seasonal items like Christmas lights and coolers? Well there I was the other day and when I saw this marvelous throw I imagined myself wrapped up in it on the couch on the weekend, reading a book and snuggling with the beagles. So much for that good idea. This entry was posted on December 9, 2010 at 7:57 am	and is filed under Sherman & Stanley. You can follow any responses to this entry through the RSS 2.0 feed. You can leave a response, or trackback from your own site. But isn’t it worth seeing Sherman look so happy? In our small grocery store they have fleece blankets too. I pass by them all the time and think, “Hmm maybe I should get two for Trumbo and Alvah.” I stopped thinking how nice it would be to get one for ME long ago. In our house all the fleece blankets have been appropriated to the Ol’ Man’s bedroom and to the dogs. My bed has on comforter and an old sleeping bag acting as a second blanket. Yep, I’m there. We purchased several fleece throws, with the thought of cuddling up under one or two with a beagle or a spouse. Well, each piece of furniture has at least one of those throws and each pet bed (we have 4)has one, also. Us pet parents steal one from the beagles when we can. 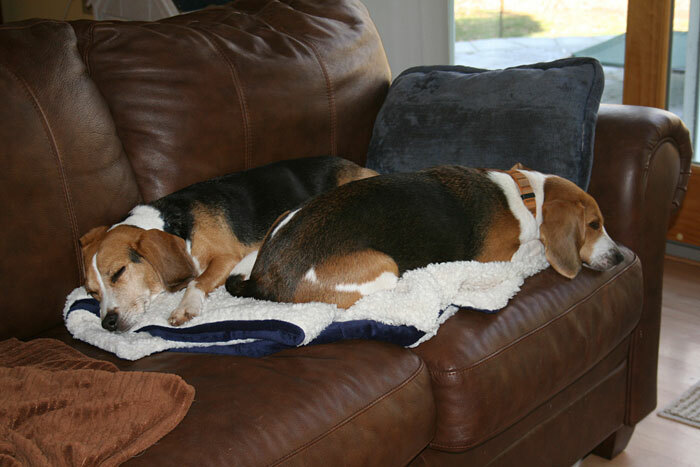 They do appreciate the blankies a great deal, though, so it’s ok.
You can’t leave a throw unattended with beagles in the house. No truer words were ever typed! Your boys think it was a very good idea. I’m sure they wouldn’t mind sharing with you. I think they’re quite pleased with themselves. And yes, beagles rule the fleece, except for those fleece objects constructed specifically for them. I am sorry – but you have viewed this situation with the wrong process. According to my two (Sweetums and Sam) that blanket had their name on it before you made the purchse. As a human care taker you just did not know that it was expected. As for your needs for a blanket – well there is that old thing in the crate you are welcome too. Sugarplums? Try a whole roast beef with pork chops on the side. My guy loves fuzzy blankies too, but especially loves “FRESH, WARM BLANKIES STRAIGHT OUT OF THE DRYER”. As soon as I bring it upstairs he comes running and claims it. Nothing like fresh warm blankies! Our dog, Merlin, loved his flannel sheets right out of the dryer. I was taking some sheets out and one of them dragged on the carpet. He hopped right on top of it like he owned it. And of course, he did. Every time I lie down with a blanket (ANY blanket), Cody must get underneath it and snuggle. Henry likes that, too, but not as much as Cody! Just yesterday I caught our Whisky Girl Beagle snuggled into my husbands flannel sweatshirt that he left on our antique settee — This thing is OLD!